What does it mean when Democrats say they support reparations? By John Kruzel on Wednesday, April 17th, 2019 at 9:14 a.m.
Slavery is sometimes referred to as America’s original sin. As the 2020 presidential race ramps up, Democratic candidates are talking about setting the country on a course of atonement through reparations. What are reparations? If eventually enacted, they would likely include a formal apology for America’s history of slavery, as well as some form of compensation to descendants of slaves. To date, no major candidate has articulated a detailed reparations policy. As an interim step, White House hopefuls have pledged to back a bill that would set up a commission to study the history of slavery, its lingering effects and how a reparations program might be crafted. We wanted to understand, in practical terms, what would happen if the bill were to pass, and beyond. A bill to establish a government panel to study reparations languished in the House for decades without much fanfare — until now. The original progenitor was Rep. John Conyers, D-Mich., who retired in 2017. The new torch bearer is Rep. Sheila Lee Jackson, D-Texas, who introduced the bill in the current Congress. "This legislation is intended to examine the institution of slavery in the colonies and the United States from 1619 to the present, and further recommend appropriate remedies," Jackson said in a Jan. 9 news release. The bill — House Resolution 40 — notes that some 4 million Africans and their descendents were enslaved from the time of the American colonies until the end of the Civil War in 1865. It also notes that discrimination continued in various forms across generations, and had at least the tacit approval of federal, state and local governments. The government, after slavery ended, "continued to perpetuate, condone and often profit from practices that continued to brutalize and disadvantage African-Americans," the bill states, "including sharecropping, convict leasing, Jim Crow, redlining, unequal education, and disproportionate treatment at the hands of the criminal justice system"
If the bill passed Congress, a commission comprising 13 members would be appointed within 90 days. The president and House speaker would each appoint three members, with the president pro tempore of the Senate appointing another. The other six members would be selected by "major civil society and reparations organizations that have historically championed the cause of reparatory justice." Commission members would likely be drawn from a range of disciplines to address the legislation’s broad charter, and could include lawyers, economists, historians, activists, civil rights leaders, public education and media specialists, said Carlton Waterhouse, a law professor at Howard University who studies reparations. The major questions the commission would pursue center on the history of American slavery, the government’s role in discrimination, and a redress for past injustices, said Waterhouse. The commission would hold hearings, gather documents and bring on experts to create a report, he said. This process would culminate with the commission recommending "appropriate remedies" as part of a report to Congress due within a year, the bill states. H.R. 40 would authorize $12 million to set up the study commission, but it’s silent as to how reparations would ultimately be financed. "The bill merely establishes a commission to consider proposals for reparations," Robin Chand, an aide to Jackson Lee told us. One of the foremost scholars on reparations, Duke University’s William Darity, estimated the United States would need to spend several trillion dollars to redress its historical wrongs, according to Vox, which noted that other estimates put the cost from $6.4 trillion to $14 trillion. The commission would be charting new territory in terms of recent U.S. history. The first — and last — federal call for reparations in the United States came during the waning months of the Civil War. But following President Abraham Lincoln’s assassination, President Andrew Johnson reversed Sherman’s order in less than a year. Since then, no U.S. slavery reparations program has come close to being enacted. Historical models from other countries may be instructive. One model is a massive administrative reparations program involving many recipients, said Naomi Roht-Arriaza, a professor at the University of California Hastings College of Law. She cited German reparations to individuals (not the state of Israel) after the Holocaust as one example. Another type are historic reparations, as in the case of former colonizers. She cited the example of Germany’s fairly recent emergence as a major benefactor of Namibia, a former colony. A slim majority of African Americans support reparations, according to a roundup of polling by Gallup. But polls show other races are less enthusiastic about reparations for African-American descendents of slaves, and white Americans oppose the idea by a wide margin. The online forum Countable — which GQ magazine dubbed "Tinder, but for unsexy congressional bills" — showcases strong opinions on both sides of the H.R. 40 debate. "As an African-American male, I feel overt and covert racism all the time," said the top-rated comment opposing the bill. "Nevertheless, I do not believe receiving some monetary compensation will make right the atrocities of the past. I think this will create greater resentment and outweigh the goal of unity between the races." Others argue that those who directly inflicted and suffered from slavery have long since died, and that too much time has elapsed between slavery and present-day America to justify reparations. Roht-Arriaza said reparations are more likely to happen if Americans think about the program in broad terms. "The major hurdle is getting people to think beyond issuing checks to individuals, which most people see as impractical," Roht-Arriaza said. "One of the advances in international law has been to redefine reparations away from simply monetary compensation to a much more holistic approach. "A study commission would help make that clear," she said. A sea change in 2020? Discussion of reparations has been raised in every presidential election among Democratic candidates since the 2008 election, said Waterhouse, of Howard University. During the 2008 campaign, then-candidate Barack Obama, later to become the nation’s first black president, opposed reparations, arguing that the best way to amend for the past is to focus on the present and future. "I think the reparations we need right here in South Carolina is investment, for example, in our schools," Obama said in a July 2007 CNN debate. 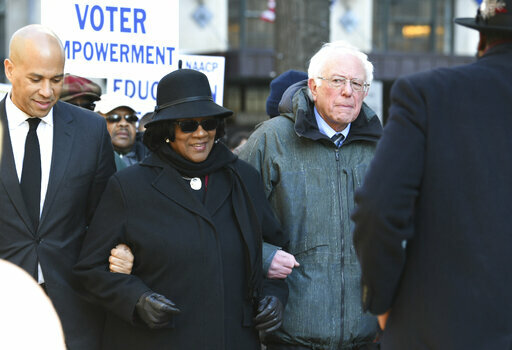 In 2016, Democratic presidential candidates Sen. Bernie Sanders, I-Vt., and Hillary Clinton, like Obama, emphasized the need to focus on addressing economic problems in the black community by improving education, providing jobs and addressing poverty, in lieu of reparations. While the study commission bill did not get much attention before, Democratic candidates who appeared at a recent conference in New York hosted by the Rev. Al Sharpton pledged their support. Among them was Cory Booker of New Jersey, who has since introduced a reparations study commission bill in the Senate, to serve as a companion to the House version. Some of Booker’s Republican counterparts in the Senate gave his proposal a frosty reception. "I think it’s too remote in time," said Sen. Lindsey Graham, R-S.C., according to the HuffPost. "I think it’s too divisive." But Waterhouse said the newfound traction among Democratic presidential contenders could potentially represent a sea change for reparations, though it may be too early to tell. "The question is not new, but the level of support has grown among Democrats," Waterhouse said. "I think this represents a growing appreciation for the continuing significance of racial discrimination and a much greater awareness of the impact of white privilege and white supremacy in individuals’ life chances." But he said candidates’ depth of commitment is still hard to gauge. Several candidates have gotten pushback for saying that race-neutral proposals that would disproportionately help blacks are a form of reparations. Policies that generally help the economically disadvantaged, according to Waterhouse, "fall outside of the international model and historic definition of reparations." Still, he’s waiting to see if this growing awareness translates into more substantive proposals. "Greater education of the candidates and the public may produce deeper understanding," he said, "and, in turn, deeper commitments." Countable, "Commissioning A Study To Consider Reparations for African Americans"